Home/Blog/Which Staircase Is the Best Staircase for You? Which Staircase Is the Best Staircase for You? Spiral staircases can transform any home, a beautiful look that uses minimum space. With a range of materials to choose from, a spiral staircase could bring a fairytale element or a contemporary look. A glass staircase is a great way to maintain a minimal and open space. By using glass, the transparency keeps the space light and doesn’t darken a room. Maybe your home is made up of three levels? 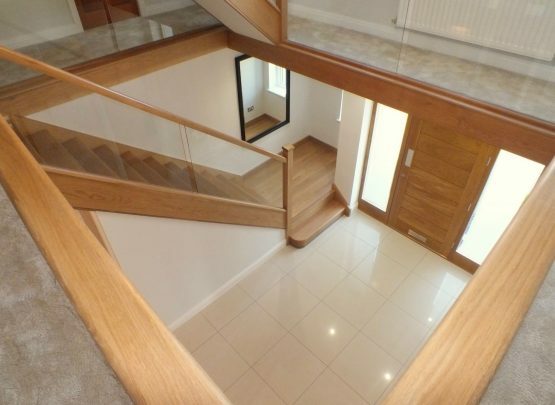 A glass staircase can allow the stairs to ‘float’ between levels. Looking for a design that’s sleek and minimal? An open staircase could be perfect. They are well known to look both modern and sophisticated. Many decide on a styling that makes the staircase almost seem like it’s floating, you can achieve this with a metal handrail paired with glass sides. If your staircase is at the front of your home, a double staircase could be the best option for you. Having two staircases leading to a landing on opposite sides of the room can look extremely grand, especially if they’re adjacent to the front door of your home. You can guarantee that this will be the first thing that any visitor sees when they visit your home. Do you have a family home with lots of space? A sweeping staircase could be the statement it needs. The stairs on a sweeping staircase feel much wider due to a gradual incline when compared with other styles. For a truly unique type of staircase, a customised railing allows you to create your own design. This design could be something simple or if you’re really looking for a stand out feature then you could do something totally different. There are so many different designs and styles of staircases, it can be a little daunting to say the least. Luckily that’s why there’s companies out there to assist you right from the point of design. Edwards & Hampton Joinery have years of experience in their field, and offer a free consultation. So what are you waiting for? Get in touch with them today and see if your home can be transformed. To what extent can a staircase be renovated? What are the names given to a staircases parts? What timber should your new staircase be?